Dr. William F. Keegan is Chairman and Curator of Anthropology, Department of Natural History, Florida Museum of Natural History. He also serves as Associate Director for Research and Collections. He holds affiliate appointments as Professor of Anthropology and Curator of Latin American Studies at the University of Florida. He is also affiliate faculty in the College of Natural Resources and the Environment. View Dr. Keegan’s Publications on ResearchGate. 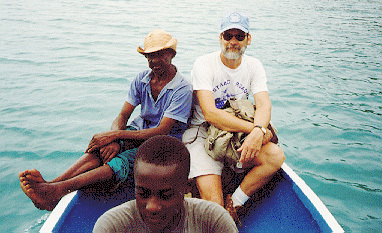 Dr William F. Keegan in Haiti, 1996. He received his Ph.D. in 1985 from the University of California, Los Angeles. Following the completion of his Ph.D. he was the Visiting Scholar in North American Prehistory at Southern Illinois University where he published the edited volume, Emergent Horticultural Economies of the Eastern Woodlands. He was Assistant Professor of Anthropology at the University of South Carolina before moving to the Florida Museum of Natural History in 1987 to develop a research-based program in Caribbean Archaeology. He was appointed Department Chair in 1994. Keegan began investigating Caribbean prehistory in 1978 in the Turks and Caicos Islands. In 1982 he initiated a systematic survey of the islands in the Commonwealth of the Bahamas during which more than 1500 kilometers of Bahamian coastline were surveyed and more than 150 prehistoric sites discovered. The most recent discoveries are sites in the Turks Islands; islands previously viewed as uninhabitable. He has participated in and directed archaeological excavations in Haiti (1995-present), the Turks and Caicos Islands (1978-present), Bahamas (1982-present), Grenada (1989, 1990), Grand Cayman (1993) and the Dominican Republic (1999). His research has been supported by grants from the American Philosophical Society, National Geographic Society, H. John Heinz III Charitable Trust, Wenner-Gren Foundation for Anthropological Research, the United Nations Development Program, and through the participation of EARTHWATCH volunteers. He is Curator of the Bullen Research Library of Caribbean Archaeology and is involved with the use of stable isotope analysis to investigate prehistoric diets. His interests range from the very specific investigation of Columbus’ first landfall to broad questions of cultural development and change. One goal has been to demonstrate how understanding and explaining Caribbean prehistory is important for investigators working in other island archipelagos. As a result, his work has attracted international attention. He has published more than 40 scientific articles detailing his research. He was awarded (with co-author Morgan Maclachlan) the Morton H. Fried Prize in 1989 for the best article in general anthropology published in the American Anthropologist. 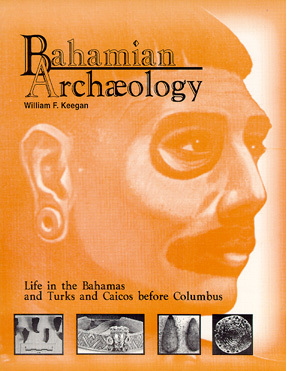 He has published two single-author books, Bahamian Archaeology: Life in the Bahamas and Turks and Caicos Before Columbus (Media Publishing, 1997) and The People Who Discovered Columbus: The Prehistory of the Bahamas (University Press of Florida, 1992); and the edited book, Earliest Hispanic/Native American Interactions in the Caribbean: A Sourcebook (Garland Press, 1991). He is the Contributing Editor for the Caribbean Area to the Library of Congress’ Handbook of Latin American Studies and the Journal of Archaeological Research. He serves on the Advisory Board of the HRAF Collection of Archaeology. He was a member of the Planning Committee for Powell Hall, the Florida Museum’s Education and Exhibition Center. He was a member of exhibit teams for First Encounters, New World Harvest, and Better Than Gold — traveling exhibits that illustrated the early Spanish exploration and colonization of the Americas — and Northwest Florida: Waterways and Wildlife which is a component of the permanent exhibits at Powell Hall. He also collaborated on Taino Visions: Past and Present with the Santa Fe Gallery, Santa Fe Community College. 31 Shirley Park Avenue, PO Box N-9240, Nassau, Bahamas.